I'm not entirely sure what I was expecting. 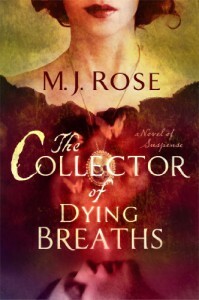 Having never read any of M.J. Rose's works before, I believe I assumed from the synopsis and the cover that it was just another Romance novel with historical undertones and a bit of adventure to add some meat to the story. There were, of course, Romantic elements that took up some huge real estate in the plot, but more than Romance there was an idea of loss, of accepting yourself and all of your personal oddities, of believing in something bigger than this single reality , and of realizing that there's always hope. Always. This book was filled with complicated emotions, confusion about personal identity and self, and fear of accepting the unbelievable. I was overwhelmed with a sense of grief for the main character for nearly the entire first half of the book. M.J. Rose was so easily able to capture that intense sense of loss that one feels when someone they love is no longer there. Having experienced the grief of losing a loved one, as many readers will also have experienced, I could easily recall all of those emotions that the author mentioned in very vivid detail. I ached with and for Jac. As a reader who flips through numerous books every month I find it very refreshing to get a hold of a book that is "intelligent". There's depth to this book, and things to be learned. I know very little about perfuming and, whether or not every aspect mentioned about the processes was accurate, I felt like I had learned something. I was curious. Fascinated. I wanted to learn more! The imagery was so rich, especially regarding the smells. I utilize essential oils on a daily basis and the scents that were described in the pages of this book called up some powerful memories. It was more than just saying "It smelled like this", M.J. rose created this incredible WORLD made of scents that created feelings and colors and sounds and memory. I do have to say that there were a few parts of the book that went a bit slow. Also, by the time I was 70% though with the book and STILL had no idea what was going on, I was a little perturbed. I wasn't expecting to have everything given away all of the sudden, but I kept waiting for hints to be dropped that would help solve some of the mystery or build the suspense, and it never seemed to happen. More and more questions were being asked without answers to any of the previous questions. It made me a little anxious to finish, which I admit may have taken away some of the joy of reading towards the end because I was so ready to discover what was truly going on. I also found the sexual tensions between characters to be more of a focus in many cases than the love they shared. The love aspects that were the most compelling were the love between a brother and sister, and the love between a mentor and student. I definitely appreciated the romantic love aspects, but felt those fell short in relation to the others in a few instances. This work was vibrant, vivid, and absolutely fantastic. My brain didn't feel dull after reading it, which is how my brain usually feels after a Romance novel. Actually, I wouldn't call this a Romance novel. There was so much more to it than just that. I appreciate how love was represented in many more forms than just its Romantic identity. Included in this work was a nod to the love we feel for family, friends, and self. It was all there, making me think about and better appreciate the love in my own life. This was a very enjoyable work. I will read more of M.J. Rose, and I would recommend her to others.